LOS ANGELES -- Former lunar astronaut Buzz Aldrin is not over the moon about the use of his photo on a series of trading cards. The 80-year-old Aldrin sued Topps Inc. this week in federal court in Los Angeles, saying the company had unfairly profited from his historic achievement when they used an iconic photograph of Aldrin standing on the moon in a series of "American Heroes" trading cards. 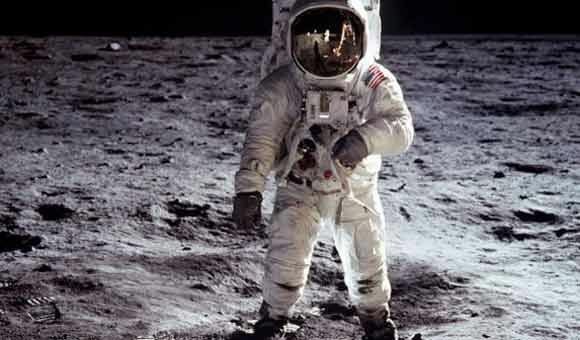 Topps attorney Michael Kahn told the Los Angeles Times that the firm has a First Amendment right to include a factual description of the Apollo 11 mission and it included an image of Aldrin in his lunar suit because he is "an American hero." The lawsuit seeks unspecified monetary damages and an order prohibiting Topps from marketing the cards. Buzz is very cool. Pleased to say that I have met him. The American space program was funded by the American people and all images are public domain. Buzz does not own the likeness and has no copyright. Totally agreed, Joe. The real Apollo heroes were the engineers who developed the system. As a part of that system some individuals were selected to go through a government funded astronaut training program, and two of them were fortunate enough to be selected as the first to set foot on the Moon. Of course in popular culture, engineers at drawing boards are boring, and test pilots are exciting. Unfortunately, though, it’s often the lawyers who attempt to have the last laugh when they conjure up frivolous lawsuits like this. Will Neil Armstrong claim a royalty for being the photographer? Will Topps call in Fox News producers to testify that the Moon landing was a hoax? Will Dan Aykroyd finally admit he was the actor inside the spacesuit? *Paulie looks around in confusion* This is news?!? Buzz, Buzz, Buzz... Why? Why now? Why not spend your energy making the case for Mars? It was my impression that NASA images (and science data) are pretty much public domain, but I would think Topps should need NASA's approval to profit from this image, no? Well, NASA recently used my computer generated images of Saturn and compiled them into an animation without my approval, although I was listed in the credits at the end of this short NASA video: solarsystem.nasa.gov/multimedia/downloads/whatsupdec20101201F-320.mov . In August Jane did inform me she that she has my Saturn graphics on her office wall at NASA/JPL Cassini mission control. Forget about men on Mars during the 21st century, Paulie. Costs are prohibitive, especially considering the need for radiation shields. The likelihood of costly failure and astronaut death is quite high. There must be a compelling need to divert a finite amount of tax money from other needs of the people. At this time robotics is a far more safe and cost effective means of solar system exploration. Again, thank the engineers. They are paving the way for planetary colonists in future centuries in the most efficient way we can right now. Sorry you missed out on the manned Moon landings. Just be glad you weren’t drafted and had to hear about them while serving in Vietnam, as was the case for me.